A note from Ed Zeigler, two hours before the Artisphere Opening Gala, said “see you this evening, this is not a late arrival party!” This phrase exemplifies the kind of energy Ed brings to all of his endeavors, including the undertone of importance for the person, place, or project occupying his mind. Ed has become part of the fabric of Greenville through his personal interest in the cultural climate of our city and its citizens, all while assisting in its physical transformation, over the last three decades, as an architect at Craig Gaulden Davis. His involvement in Artisphere is one example of his arts advocacy in addition to his 9-year tenure with Arts in Public Places. He has served on various committees for Artisphere, now a huge production that takes over most of South Main Street and, this year, included 135 artists of the 1163 applicants. 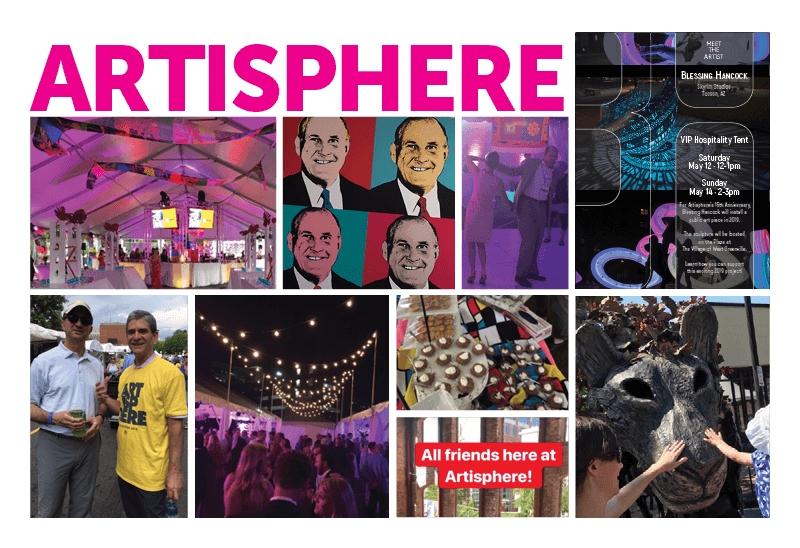 This kind of curation has brought Artisphere national acclaim for the quality of art on display and financial success for those whose work is accepted. The average revenue in 2017 was $9,150 with tens of thousands in attendance. Ed’s big news is that he will be the next President of Artisphere, taking the reins in October of this year. Cue the fireworks! His leadership will focus on the continuation of the festival’s strategic plan, a task which includes recruiting committee members, fundraising, crafting the festival and learning from previous years to make each year better than the last. For Artisphere’s 15th year, Ed will help bring another artist’s work to Greenville’s acclaimed collection of public sculptures. “Art”, he says, “broadens and improves one’s quality of life; it’s a free festival that allows art to be enjoyed and interpreted personally. And everybody needs to be exposed to that.” He says “he wants to make things better” for everyone, a mantra he carries and continuously enacts in all facets of his life and civic engagement.